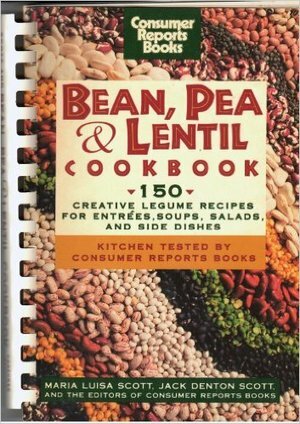 I probably purchased the Bean, Pea & Lentil Cookbook, on the suggestion of my husband, who subscribes to Consumer Reports. He may have noticed a frequent theme in my cooking, and that this specific book was completely dedicated to one of my eating loves. The rest of this book review should just be the Introduction where the authors sing the praises of Legumes. They clearly share my fondness for this food group. They had traveled the world, clocking over 500,000 miles, mostly to off-the-beaten-track locations to complete a travel book, Passport to Adventure. There was a common denominator in the foods they found….the legume. They discovered their traveling was a “culinary safari, discovering unique ways in which to cook all the many varieties of the legume family”. This book is offered on Amazon for $1.99, so you can purchase and read the rest of the introduction for yourself, including a brief description of legume plants, nutritional value, and preparing and serving legumes. Chapter 1 is Legume Techniques, Tips, and Identification. If you have never cooked with legumes, or just need a refresher course, this is where you should go. Frozen, canned or dried bean instructions are here. Most helpful is their guide to cooking times (slow cooked is always best), the quantity to prepare (dry beans equal what quantity after cooking? ), and tips such as mix warm beans with the salad dressing for better penetration and flavoring, and the addition of mashed beans as a great thickening agent for sauces and soups, which also ramps ups the nutritional value. The next six sections cover the topics of Appetizers, Soups, Salads, Vegetable Dishes, Side Dishes, and Main Dishes. A few of my favorites in each of these categories are the Beans and Tuna Milanese; Curried Fresh Green Pea Soup; Red Kidney Bean Salad (and I add fresh green beans for even more deliciousness); Baked Red Kidney Bean Casserole; Lentil Pilaf; and finally, Pinto Bean and Chicken cooked Southwestern style and served with rice. Give me a call before you come over and we can cook up some of this amazing food together!